The powerful and reliable PowerEdge T430 two-socket tower server delivers performance, expandability and quiet operation to office environments. The PowerEdge T430 is an excellent fit for a wide range of office workloads, including workgroup collaboration and productivity applications, mail and messaging, file and print serving, and web serving. The T430 is an ideal choice for small office and remote office/branch office (ROBO) sites in need of single-server performance and capacity. Accelerate performance across a wide range of workloads with the latest Intel® Xeon® processor E5-2600 v4 product family. Drive fast response times and expand memory capacity over time with 12 DIMM slots and DDR4 memory. Boost I/O performance with 6 x PCIe 3.0 slots delivering 2x data throughput compared to PCIe 2.0. Install performance where it's needed with a rackable tower form factor, short 22-inch depth and quiet office acoustics. Grow data storage over time with a choice of internal hard drive form factors and capacities, guarded by RAID options for data protection and optimized performance. Adapt flexibly to changing workload conditions with an expandable virtualization-ready platform. Save time and reduce potential for error with simplified, intuitive systems management, and help reduce costs with energy-efficient features. Protect IT investments by using the management tools you know - Dell OpenManage Essentials, BMC® Software, Microsoft® System Center, VMware® vCenter®. 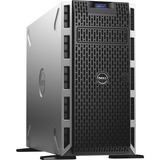 Harness your budget with energy-efficient processors, memory and power supplies and Fresh Air 2.0 capability. The Dell OpenManage systems management portfolio includes innovative solutions that simplify and automate essential server lifecycle management tasks - making IT operations more efficient and Dell servers the most productive, reliable and cost effective. Leveraging the incomparable agent-free capabilities of the embedded, integrated Dell Remote Access Controller (iDRAC) with Lifecycle Controller technology, server deployment, configuration and updates are streamlined across the OpenManage portfolio and through integration with third-party management solutions. Monitoring and control of Dell and third-party data center hardware is provided by OpenManage Essentials and with anytime, anywhere mobile access through OpenManage Mobile. OpenManage Essentials now also delivers Server Configuration Management capabilities that automate one:many PowerEdge bare-metal server and OS deployments, quick and consistent replication of configurations and ensure compliance to a predefined baseline with automated drift detection.